Friday, 6pm ET – 12am EST: Legends Mode will be enabled on the Prismata alpha server! Saturday, 1pm EST: The PAWC Wildcard Tourney will take place, broadcast live on twitch.tv/lunarchstudios, with casting by the PAWC finalists and Lunarch Studios co-founder Elyot Grant. 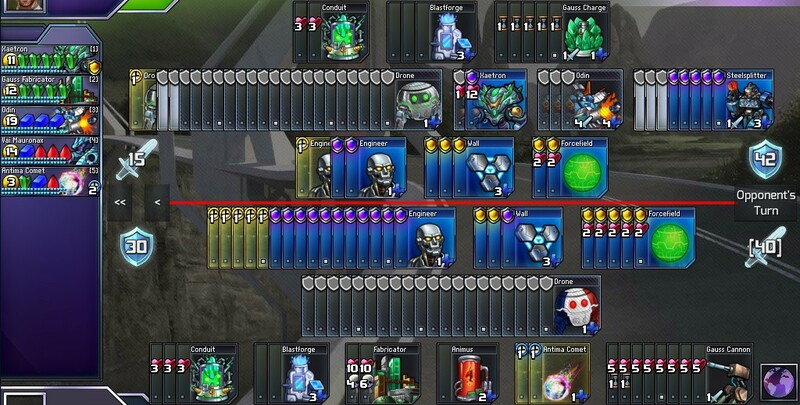 Only 1-supply units will be generated as random units in the second Prismata tab. They will each have 20 supply. For us, the Legends Mode test will be a step toward the development of a new feature called Prismata events—regularly occurring time-limited special modes and challenges. We’ll be experimenting with alternate rules and trying out various types of brawls, warzone tourneys, and other fun things. The long-term plan is to have a schedule of different events, an event history, and leaderboards/prizes as well, but we’re starting small for now. Some of the alternate Prismata rulesets will also be tested for the Casual Match mode as we look to provide more beginner-friendly rulesets for new players, various bot personalities to play against, and unranked 1v1 play. You’ll see more of that in the coming weeks. 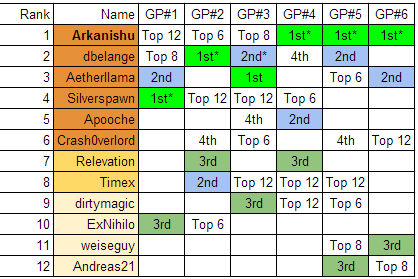 *a ten point bonus was provided to the winner’s bracket finalist in each Grand Prix round. Players ranked 1 through 6 have already secured their spot in the 8-person PAWC Finals, which will be happening on November 14 and 15. However, two more players from ranks 7 through 12 will be selected to join them, and they will be determined by a special double elimination playoff this saturday—the PAWC Wildcard Tourney. Players Relevation and Timex, ranked 7th and 8th after the Grand Prix rounds, will be granted a 1-round bye in the PAWC Wildcard Tourney. We’re also going to run a Blitz Tourney this Sunday. The tourney is open to all players who have earned at least 5 Grand Prix points in any of the six PAWC Grand Prix events. This tourney is just for fun, but the winner will receive a one-of-a-kind in-game badge. Time: 6:00pm EST, with a possible delay-of-start depending on when the Master’s League broadcast ends. The blitz event will consist of several round-robin pods leading to an 8-player single elimination bracket. Full rules for the blitz event are described here. The PAWC Grand Prix has been an extremely valuable experience for us as we work to build Prismata into an eSport-friendly game. We’ve been very pleased with all the feedback we’ve received, and we hope you’re all looking forward to this weekend’s events!